At first glance, Shenzhen’s 2010-2020 Comprehensive Plan seems a writhing mass of blue snakes and bright hotspots. Three borders have enabled urbanization in Shenzhen: the border with Hong Kong, the second line, and the city limits, which abut Dongguan in the northwest and Huizhou in the northeast. Two economic corridors have facilitated Shenzhen’s growth: the Guangshen highway corridor and the Kowloon-Canton Railway. The Guangshen highway corridor parallels the area’s riparian trade routes, which were the means of Han expansion from Guangzhou southwardly on the Pearl River and its tributaries. The KCR, of course, was the British attempt to preempt and redirect the PRD’s extensive trade network. This grid enters everyday conversation through place name protocols. For example, no one today refers to the “second line”, which evokes the yesteryears of early reform. In contrast, ever since the boundaries of the SEZ have been made coterminous with city limits, we now speak of guannei and guanwai, or “inside the gate” and “outside the gate”, respectively. Interestingly, however, I rarely hear people speak of the guanwai area well east of the railroad as “guanwai”, instead, it is more common to refer to that part of Shenzhen as “the east”. In fact, the SEZ’s historically most important hubs are all located on this grid. Luohu/ Dongmen is the first stop on the Chinese side of the railroad, while Buji was the first stop on the guanwai side of the second line. Likewise, Shekou was the end of the old riparian trade network, activating Delta resources. Bao’an District government is found just over the guanwai side of the Guangshen highway corridor and Shajing Wanfeng Village, once called “the first village in the south” occupies the area just south of Dongguan on the Guangshen Highway corridor. Given the importance of political territorializations and infrastructure to development, it is unsurprising that the poorest areas in Shenzhen are either in (a) the guanwai area between the railroad and highway corridors (Shiyan and Guangming) or (b) the East. With the exception of Guangming, all of Shenzhen’s other three new districts — Pingshan, Longhua, and Dapeng — are located in the east, far from easy access to the railroad, let alone the Pearl River and riparian access to Guangzhou. In the new Comprehensive Plan the old hubs appear renamed, but their functions unchanged. The Guangshen corridor has been resutured to the Pearl River through the Qianhai Center. 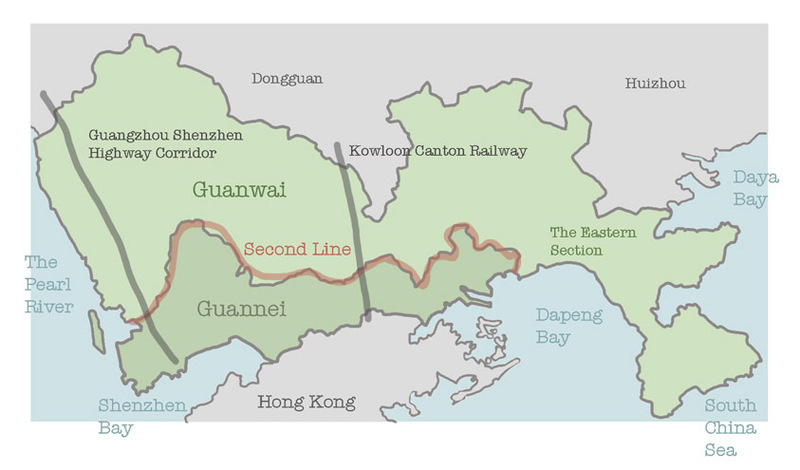 The Luohu/ Dongmen railroad corridor has been interestingly diverted into two streams, one that enters guannei at Huanggang/ Lok Ma Chau and leaves guanwai through Guangming and a second that enters guannei at Luohu and then exits guanwai through Longgang. Meanwhile, Hong Kong has been absorbed/ extended into the Shenzhen administrative apparatus at both the Lok Ma Chau Loop and Qianhai Cooperation Zone, begging the question: will the next Comprehensive adjustment will be political integration of the two cities and the re-establishment of a first or second line at Shenzhen city limits? Indeed, the question doesn’t seem too far-fetched when we recall that for 5 months in 1997, the transition government for the Hong Kong Special Administrative Zone met in Shenzhen. This entry was posted in noted and tagged erxian, guannei, guanwai, kowloon canton railway, Lok Ma Chao Loop, new district, qianhai, Qianhai Cooperation Zone, second line, shengang, shenzhen, shenzhen identity, shenzhen map, urban planning, 前海深港现代服务合作区. Bookmark the permalink. A get post for study! Just wondering, how did you get the first figure of this post? 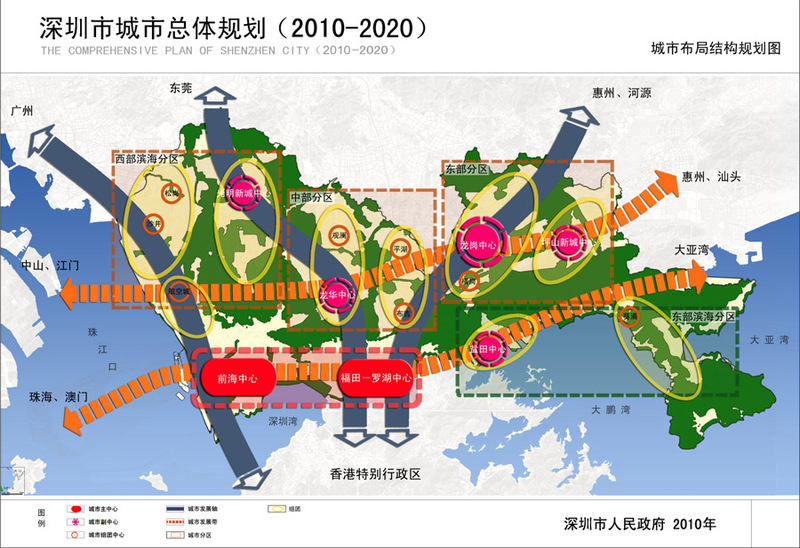 The entire 2010-2020 Overall Plan is online at: 深圳市城市总体规划（2010－2020）. In addition, there are plans for specific areas, as well as District plans. In fact, all of Shenzhen’s official documents are online. Only be aware: they are frequently taken offline at the end of term.